“It’s better to pursue one bad idea to its logical conclusion than it is to start and not finish ten good ones,” Michael said. Then everything changed. I think it was in late 2001 when Michael arrived at UQ and gave a series of talks on quantum computers. I was hooked and I immediately dropped everything and started working with Michael “in my free time” on quantum entanglement and condensed matter systems. I once heard a definition of a golden age in science as a period when mediocre scientists could make great contributions. (I forget when and where I heard this and a cursory google search didn’t turn up anything.) The early 2000s were definitely a golden age for quantum information theory and I had the greatest luck to work with one of its architects. In practically no time whatsoever (in comparison with applied mathematics) we’d written a couple of papers on entanglement in quantum phase transitions. But at the same time frustration, edged with desperation, was growing. I was having all these amazing ideas but, somehow, when I started writing one of them down it started to seem just sooooo boring and I promptly had a better one. My hard drive filled with unfinished papers. I had less than a year until my money was gone and no new papers! I then went to Michael and told him of my frustration. And it was this complaint that had prompted him to give me his advice. All at once, it was clear to me what I’d been doing wrong. So I threw my energies into a problem Micheal suggested might be interesting: proving the general Coffman-Kundu-Wootters inequality. This was a hugely satisfying time; although I didn’t end up proving the inequality during my PhD I managed to, mostly by myself, work out a generalisation of a formula for a mixed-state entanglement measure that I was convinced would be essential for a proof (this sort of thing was a big deal in those days, I guess not anymore). Every day I was tempted by new and more interesting ideas, but I now knew them for the temptation of procrastination that they were. Michael’s advice has stuck with me ever since and has become one of my most cherished principles. These days I’m often heard giving the same advice to people suffering from the same temptation of the “better idea”. 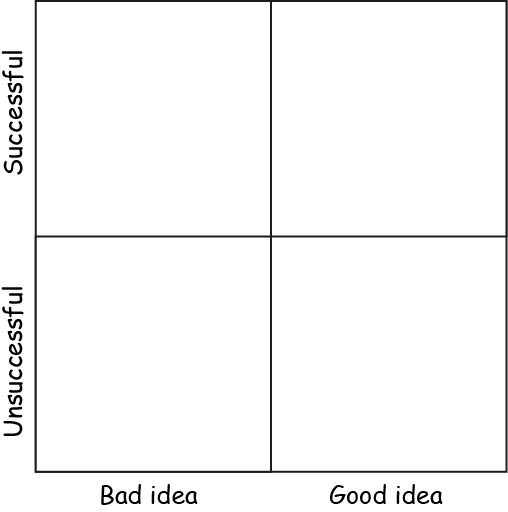 Now “focus on one idea” is all very well, but which idea should you focus on? (You will have no doubt noticed that I was rather lucky Michael had the perspective to suggest what was actually a rather good one.) What do we do if we have lots and lots of good ideas, each one of them clamoring for attention? How do we break the symmetry? How can we best choose just one or two ideas to focus on? How should you split your most precious resource, your time, while balancing the riskiness of an idea against its potential return? Now something should be obvious: you should never invest in an asset with the same return but higher risk, nor should you ever invest in an asset with the same risk but lower return. This picks out a thin set of assets living on the “boundary” of (basically the convex hull of) all the assets, called the efficient frontier. 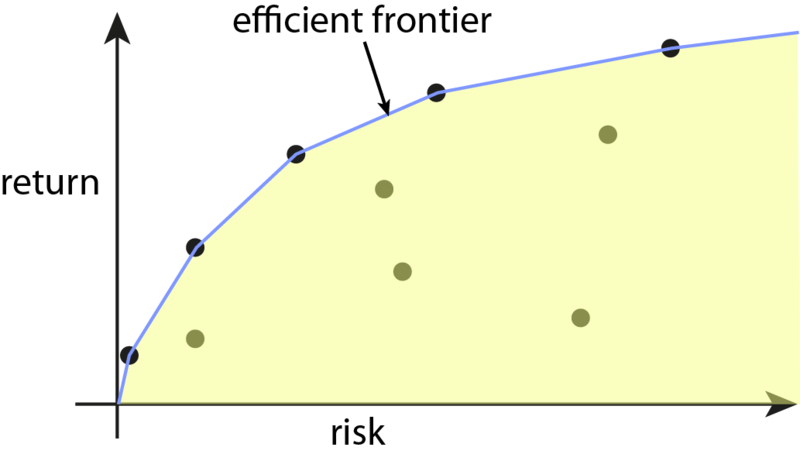 You should only ever invest in assets on the efficient frontier. Science, Nature, Annals of Mathematics, etc. Chern-Weil theory applied to classification of quantum phases via quasi-adiabatic continuation. 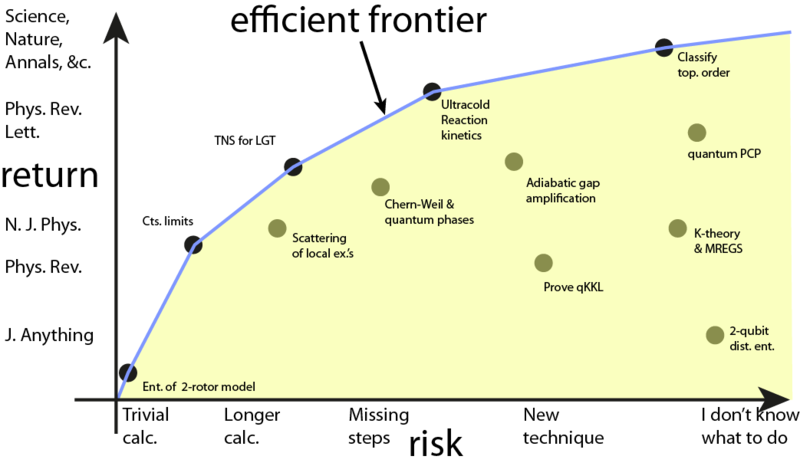 Reaction kinetics for ultracold chemistry. Continuous limits for quantum lattice systems. Tensor networks for lattice gauge theory. The scattering problem for local excitations in lattice systems. Prove the quantum PCP conjecture. Improve the gap for adiabatic quantum computation. K-theory for the MREGS problem. Classify topological order in higher dimensions. A compact formula for the distillable entanglement of two qubits. Calculate the entanglement of the 2-rotor rotor model. Prove the quantum version of the KKL inequality. Looking at the results it quickly became apparent that I shouldn’t really invest my energy in a formula for the 2-qubit distillable entanglement (shame! I would be interested in solving that one, but I just can’t see how it would be useful to anyone, including to myself!!!) Also, I should steer clear of the quantum KKL inequality, the quantum PCP conjecture, and K-theory for MREGS. Note that all of this is completely and utterly subjective! You might well argue that a proof of the quantum PCP conjecture would be a tremendously impactful result on par with the quantisation of quantum gravity. But my purely subjective assessment at the time was that it would not be of the same level of impact (for me) as, say, classifying topological order in all dimensions. Thus, out of the top 12 ideas floating around my head only 5 remained. This is still way too many! To winnow down the list it is helpful to use an investment strategy employed in portfolio management which is, roughly speaking, to invest a more of your capital in less risky assets than riskier assets (i.e., don’t put all your eggs in one risky basket!!!!) Thus I dropped the riskiest idea and I also dropped the most trivial one as not really giving much personal reward. I was left with three ideas. This was just about enough for me, and I spent most of my available energies on those. Dreams: they do not work for me! There are several stories of great discoveries been made in dreams (see this wonderful wikipedia list for some famous ones). Unfortunately I have never had the good luck to have a dream which gave me a creative insight to solve a problem. That isn’t to say that I don’t dream about my research. Last night, for instance, I dreamt of classifying two-dimensional quantum phases using a quantum generalisation of the j-invariant and some other invariant which I, in my dream, for some reason wrote as . When I woke up I quickly checked whether any sense could be made of this. As usual, far as I could see, it is total nonsense. Sigh. I only get results after hard slog. I have to make lots and lots and lots of mistakes and only then, slowly and gradually, the result emerges, reluctantly and complaining all the while, in its final form. I can’t remember ever really experiencing a dream or an “aha” moment that turned out to be really correct. Waterloo, Canada. It was early 2004. It was cold. I was cocky and full of the naive self-satisfied arrogance of a young physicist convinced of his powers. Filled with dreams of glory I made my way onto the airport shuttle to return home to Bristol. I was returning from QIP 2004. It had been an exciting week. I had just enjoyed a string of inspiring talks on a variety of fascinating topics across the full spectrum of quantum information theory. There was a palpable buzz in the air: quantum computers were coming! We were all positioning ourselves for the game of the millennium. As far as I was concerned, the only game in town was quantum algorithms, and fame and fortune would be awarded to those lucky few who could find a quantum algorithm yielding the holy grail of the exponential speedup. My mind was a ferment of ideas; I’d just seen a fabulous talk by Oded Regev on quantum complexity, cryptography, and lattice point problems. I was convinced this was where quantum computers would exhibit a speedup. Oded had presented a truly lovely result showing that if you could prepare a very special kind of quantum state, a superposition of gaussians centred on the points of an (unknown) lattice in , you could decide the shortest/closest vector in a lattice problem in polynomial time (in n). Wow! That would be a demonstrable exponential speedup over the best classical algorithm! What’s more, I had an “in”: I knew some quantum optics and I could see that the natural language to discuss this problem would be that of continuous quantum variables. It would be so simple: I’d find a quantum-optical circuit that naturally prepared this state, discretise it, and solve the problem. Along the way I’d introduce a totally new paradigm of continuous quantum algorithms!! Thus began the worst year of my life. The year 2003 had already been very difficult for me for a variety of reasons. I’d started my first two-year postdoc in 2003 and it had taken me a long long time to settle down. I had found moving countries to be so much more difficult than I imagined. This meant that my productivity had basically fallen to zero for a year (everything you see from me on the arXiv during this period, with one exception, are papers that had been developed during my PhD.) So there I was, at the beginning of 2004, resolved to write the big one: a paper that would one day become as famous as Shor’s algorithm. I figured they’d call it Osborne’s lattice algorithm. Of course, when giving a talk, I already knew I’d always modestly refer to it as “the quantum lattice point algorithm”. Awesome. I worked tirelessly. I spent hours and hours in a row, day after day, completely focussed on this one problem. I dreamt about it. To solve it, I deployed the full arsenal of my quantum optical tricks to annihilate this problem. And at the beginning it looked really promising. I had the basic idea clear (use a phase kickback trick and continuous-variable teleportation to create the superposition, then correct the phases afterward). Slowly, but surely, a disturbing pattern emerged. I’d begin really inspired, convinced that I was finally on the right track. Then I’d carefully write up my latest version of the algorithm. Then I’d find the mistake, which always turned out to be that I’d simply misunderstood some aspect of the problem. Then I was right back at square one. There was simply nothing to be recovered because every damn time the mistake was that I’d misunderstood the problem and tried to solve the wrong thing. This ecstasy/agony cycle took, variously, one week to one month each time. This lasted over 6 months. I was becoming exhausted. I didn’t work on anything else. My personal life was in a shambles. But I persisted. Surely this time I would do it. 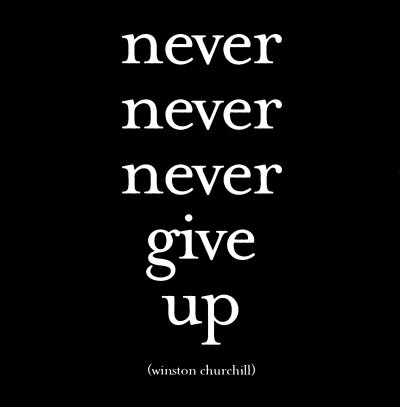 Giving up was for losers. Instead of giving up I doubled down and enlisted the help of Nick Jones, a PhD student at Bristol at the time. I am filled with admiration for Nick who, with limitless patience, worked with me at the board hour after hour on this wretched problem. But it was, alas, to no avail. Finally, humiliated and defeated, I gave up. I think it was October 2004. This was the worst feeling: nearly a whole year gone with absolutely nothing to show for it. Worse, I was wracked with guilt, feeling I’d totally wasted Nick’s time. Things soon got better. By a miracle my postdoc had been extended for a while, so at least I wasn’t on the job market straight away. Secondly, at the end of 2004 I went to a truly inspiring conference at the Isaac Newton institute where I met up with Guifre Vidal who showed me something amazing: the Multiscale Entanglement Renormalisation Ansatz, and I realised that what I should do is focus on more my core skill set (quantum entanglement and many body quantum spin systems). I began working on tensor networks, read a fantastic paper of Hastings, and got into the Lieb-Robinson game. If I had my time again what would I do differently? I don’t regret working on this problem. It was worth a try. My mistake was to keep working on it, to the exclusion of everything else, for too long. These days I am mindful of the advice of Wheeler: you should never do a calculation until you already know the answer. I also try to keep a portfolio of problems on the go, some risky ones, and some safe ones. (More on that in a future post.) Finally, upon reflection, I think my motivation for working on this problem was totally wrong. I was primarily interested in solving a famous problem and becoming famous rather than the problem itself. In the past decade I’ve learnt to be very critical of this kind of motivation, as I’ve seldom found it successful. PS. I find the QIP 2004 conference photo rather striking: so many of the attendees have moved on to great success in quantum information theory and have now become household names. It was still a year before Scott Aaronson would start his famous blog. I never would have guessed at the time. Are you looking for an interesting idea? A common complaint I’ve heard from my colleagues is that their favourite and best work is their least appreciated and least cited work. (I certainly feel this way.) It is not hard to imagine why this is: probably their best work is the one that contains the most unfamiliar and original ideas, the most difficult calculations, and is probably the least clear to anyone except the author because it is very difficult to explain something truly new. So, if you are looking for something truly interesting to work on why not pick an author you respect and find their oldest least cited paper. (I.e., don’t choose a new one that simply hasn’t been read yet.) Read it forwards and backwards until you completely understand it. There will surely be some treasure buried in there. And hey, you can be pretty sure that absolutely noone else will be working on the same thing. You are currently browsing the archives for the soft post category.